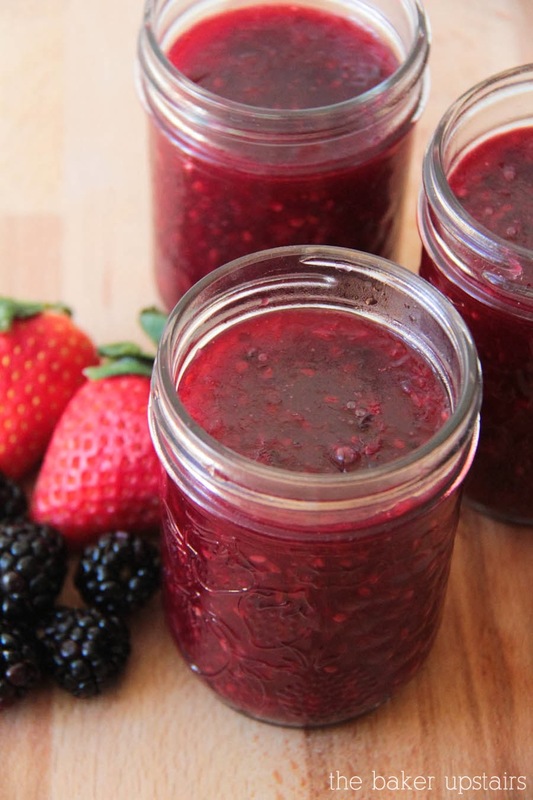 Homemade jam is one of my very favorite things to make. I have some in the freezer pretty much all the time! I don't think my girls have ever even had store-bought jam, since the homemade stuff is so much better. 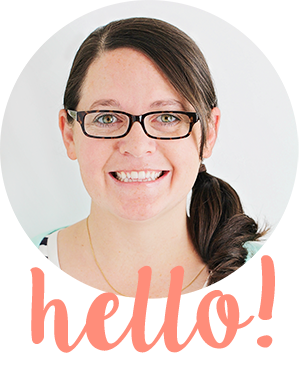 I love to use the low-sugar pectin because I feel like the flavor of the fruit really shines through and it is so much tastier! Not to mention it's better for you too… it's a win-win! If you have ever wanted to make jam before and felt too intimidated, have no fear! I took pictures all along the way this time, so I could share them with you. 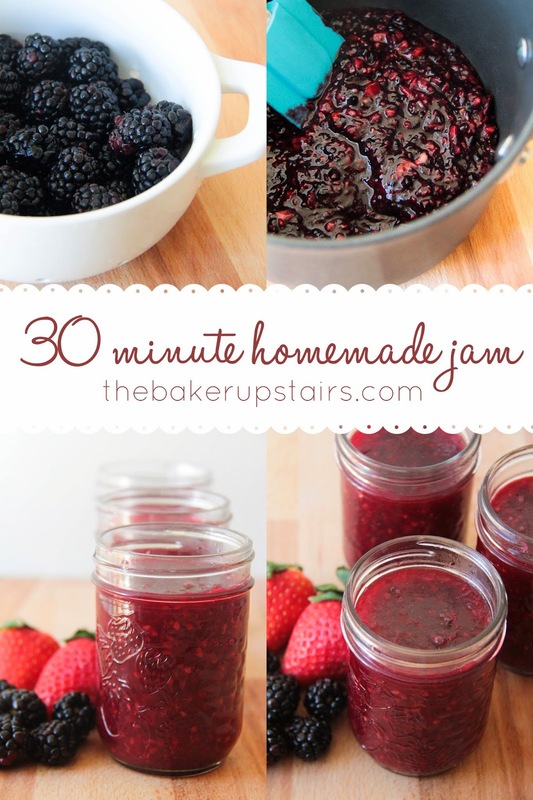 I've labeled this thirty minute jam, but really it took me about twenty minutes to make, start to finish. And it seriously couldn't be easier. I've made jam with lots of different fruits… peaches, strawberries, blueberries, raspberries, blackberries, cherries, apricots, you name it! They're all pretty awesome. Some of my favorites have been combinations of fruit; strawberry-peach is super rad, as is any combination of berries. For this jam, I decided to use about 2/3 blackberries and 1/3 strawberries (because that's what I had in my fridge threatening to go bad). Wash your fruit and drain it well. Step 2: Chop/pulse/mash the fruit! If you don't have a food processor or blender, you can also chop the fruit and then use a potato masher to mush it up a little. Either way works great! Step 3: Add pectin and cook! I really love this low sugar pectin, especially because it comes in the container instead of in a packet, so I can measure out the exact amount I need. (I'm not being paid by Ball, by the way, I just really love their product!) Add the liquid you're using (I used water this time, but I usually use unsweetened apple juice) and the pectin, and stir until it's smooth. Heat, stirring constantly, over medium high heat until it reaches a full rolling boil that can't be stirred down (this usually only takes a few minutes for me). Add sugar all at once, bring back to a boil, and let boil for one minute. Remove from heat. Step 4: Ladle into clean jars! I like to do freezer jam instead of canned jam for a few reasons. First, it's waaaaay faster and doesn't involve turning my kitchen into a sauna with the steam from the canner. Second, I feel like the jam stays fresher in the freezer. It keeps the same beautiful color and fresh flavor that it has right after you make it. Really, either way works fine, and if you want to use the water bath canner, go right ahead. You can find good directions for that here. If you want to take the easy route like me, just ladle your jam into clean jars (or even plastic containers), leaving 1/4-1/2 inch of space at the top of the container. Cover with clean lids and bands, and refrigerate overnight, then freeze. To use, thaw in the fridge overnight. Wash fruit and drain well. 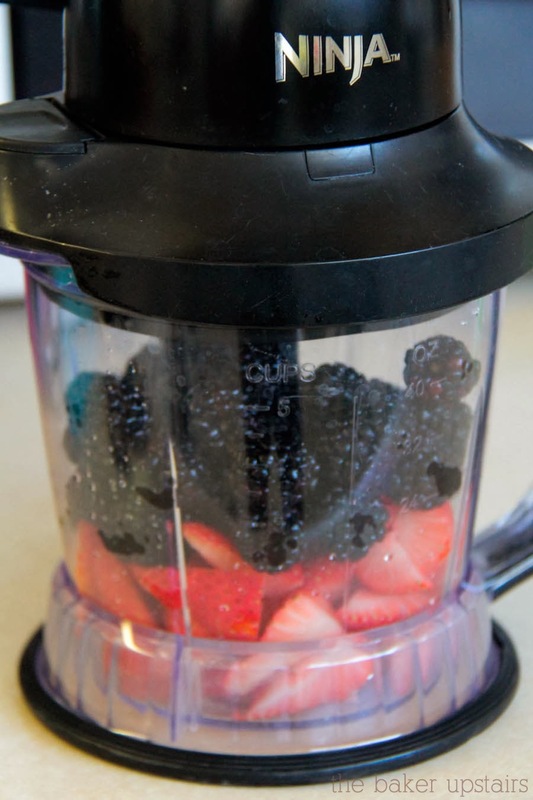 Pulse fruit in a blender or food processor until it is mashed into small chunks. (You can also cut the fruit into small pieces and use a potato masher to mash it up a little.) You should end up with about 2 cups of mashed fruit total. Pour fruit into a medium saucepan and add juice or water. 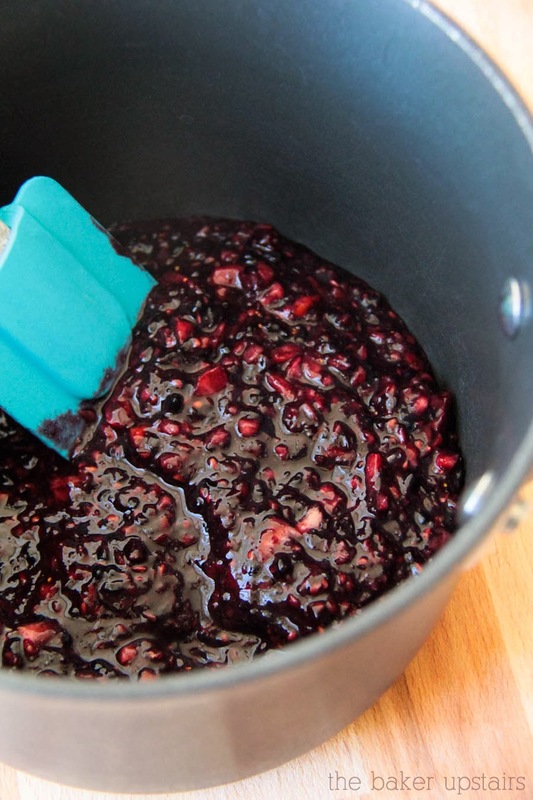 Gradually stir in pectin and mix well. Heat, stirring constantly, over medium high heat until it reaches a full rolling boil that can't be stirred down. Add sugar all at once and stir well. Return to a boil, stirring frequently, and boil one minute. Remove from heat and ladle into clean containers. Store in refrigerator overnight, then freeze. Makes 3 half-pint jars (or 3 cups total). This looks great! I will definitely have to try this. 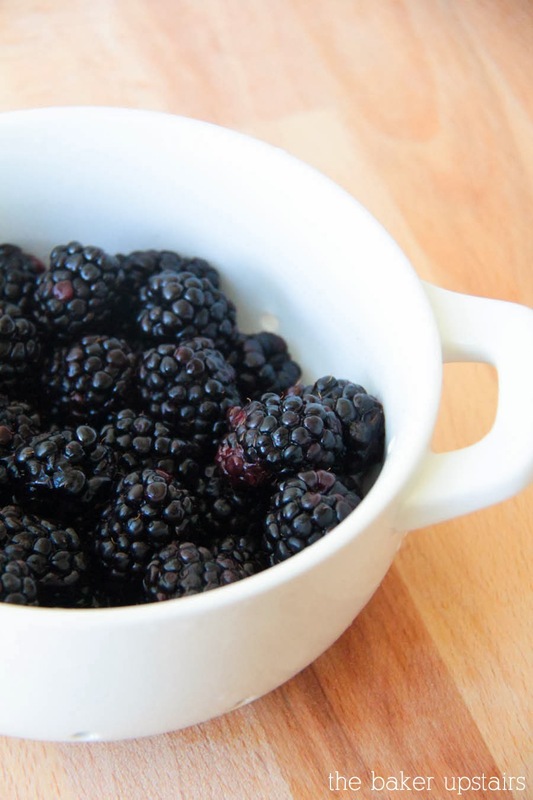 I saw some beautiful blackberries at the farmers market last week, I hope they will be there again! Fabulous blog by the way. You've got a new follower. I love this! 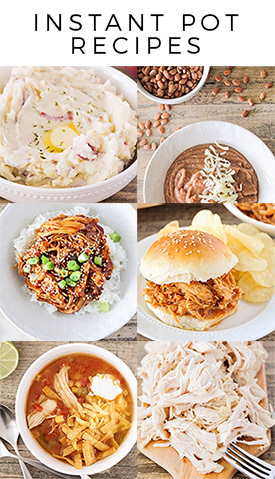 I had not heard of freezer jam until I saw this recipe. I'm so looking forward to trying it. Can I sub in frozen strawberries or other berries or do they need to be fresh? We just toss the fruit straight into the pan we cook it in and use the potato masher. by the time it is all mashed up, it is also cooked! Thank you so very much for sharing your canning with us. I have always wanted to make jam but have always been intimidated by the canner. I will definitely give this a try. Wow! I had no idea this was so easy! I am totally going to try this! What would be the best way to sub in rhubarb? Any thoughts? 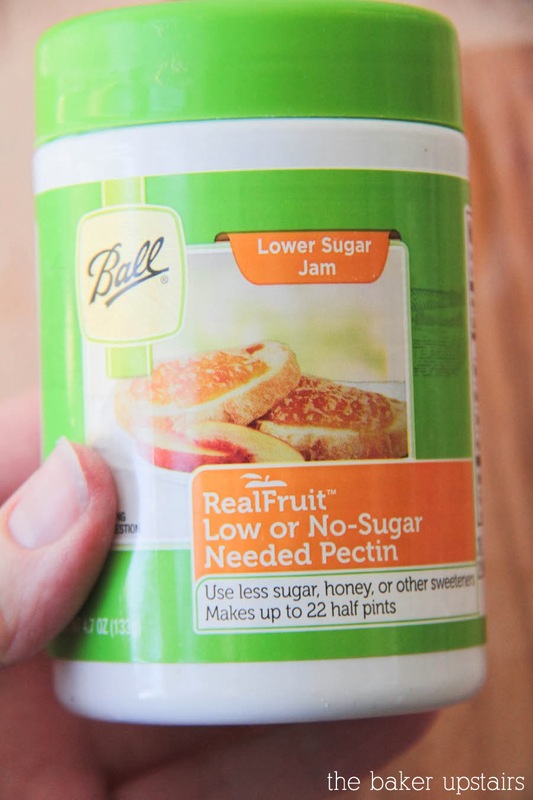 i would love to make jam, but was wondering.... why do u need pectin..what does it do? 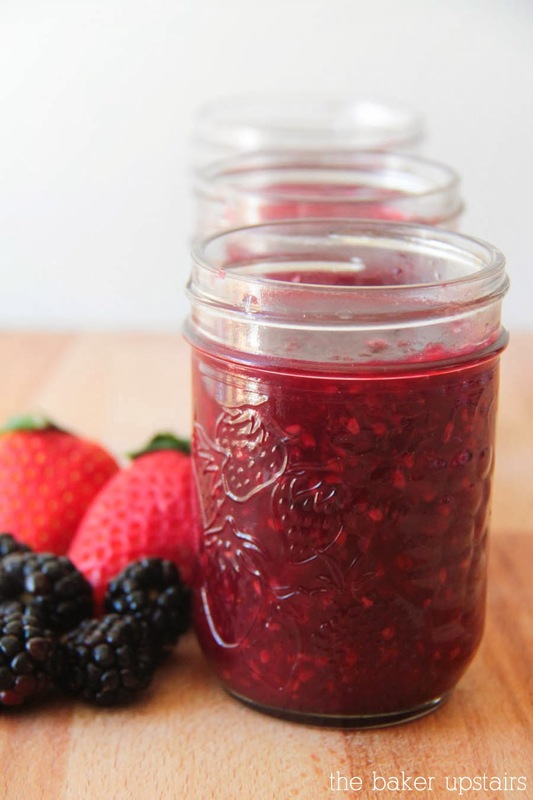 Pectin is what makes the jam thicker. It's a natural product that's found in various fruits. The powdered kind that is used in this recipe is made from apples. Hi Alicia, this looks great! quick question--if you are using the jam right away, can it just stay in your refrigerator or does it need to be frozen? how long will it stay good in your fridge? thanks! Yes, if you're using it right away you can just keep it in the fridge. It should last at least 1-2 weeks.